The first one is set in a typical Chi-town tavern, the second is in a walk to the Lake Michigan shores and the third is a remarkable existential monologue in a classic city apartment, plus they are all about the relationships contained within (or out, as the second one goes). The main cast is sensational, virtually all of them stand outs, and the settings are longingly authentic. Those who have moved from the Chi will revel in their youth again, as the characters are living in the land of surprise connections. Like Woody Allen has done romance and Manhattan, Michael Glover Smith has paired the pitch of woo in a sophisticated Midwestern burg. “Rendezvous in Chicago” is the romance-in-the-Windy-City movie the world has been waiting for. In segment one, a literary grad student named Delaney (Clare Cooney) is working on her thesis in a quiet Chicago tavern. She is approached by Paul (Kevin Wehby), a lothario-in-waiting. As he makes his pitch, Delaney offers a literature challenge (with a seductive twist) … can Paul name all the characters in a famous Russia novel? The implications become the scenario. 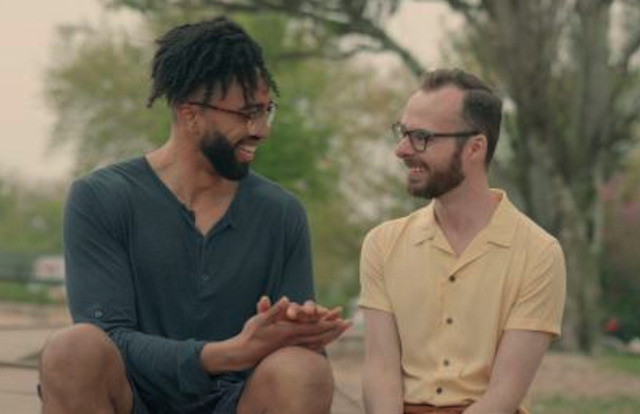 Segment two regards the couple Rob (Matthew Sherbach) and Andy (Rashaad Hall), as they take a walk in the Rogers Park neighborhood. They are having the eternal debate regarding cats versus dogs, as they encounter the neighborhood on their way to the beach. Segment three is the apartment… Wyatt (Shane Simmons) is caught cheating on his live-in girlfriend Julie (Nina Ganet). After she kicks him out, she has something to say. Patrick McDonald of HollywoodChicago.com will host a Q&A for “Rendezvous in Chicago” at the Gene Siskel Film Center on Monday, February 11th, 2019. Click the link below for show time and details. Rendezvous in Chicago” has limited run from February 8th-13th, 2019, at the Gene Siskel Film Center, 164 North State Street, Chicago. Click here for specific showtimes and information on the Q&A panel with Patrick McDonald. Featuring Clare Cooney, Shane Simmons, Kevin Wehby, Rashaad Hall, Michael Sherbach and Nina Ganet. Written and directed by Michael Glover Smith. Not Rated.